The Hartwood 9’7″ x 9’7″ FSC Pressure Treated Venetian Pavillion is offering you the perfect way to finish off your garden with some serious style. This is a very impressive looking pavilion and at its peak its stands tall and proud at a very impressive 10 feet high. The pavilion provides you with plenty of shade, but it is also designed to let in a little bit of sunlight so that you get the perfect mix. Its large size means that you can use this for many things from throwing a little party for your friends and family to just enjoying a pizza with the kids on a warm summers evening. While it may look like there is not a lot to this pavilion. It has actually been designed very well and made with some very fine and high quality materials. All of the timber has been pressure treated to make sure that it is strong and resistant against rot and it is constructed using timber that is thick so it will be able to stand up against the wind. 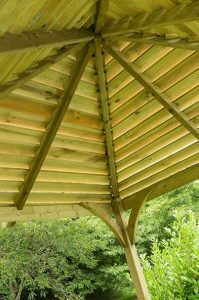 The roof is made with very impressive timber planks that have been expertly placed these are supported with a cleverly designed framework that is going to ensure this pavilion lasts for many years. 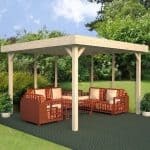 So you are looking for that perfect addition to finish your garden off just right and you have no clue what to get. Sure you could go for a large workshop or perhaps even a summerhouse, but what if you want something a little different? 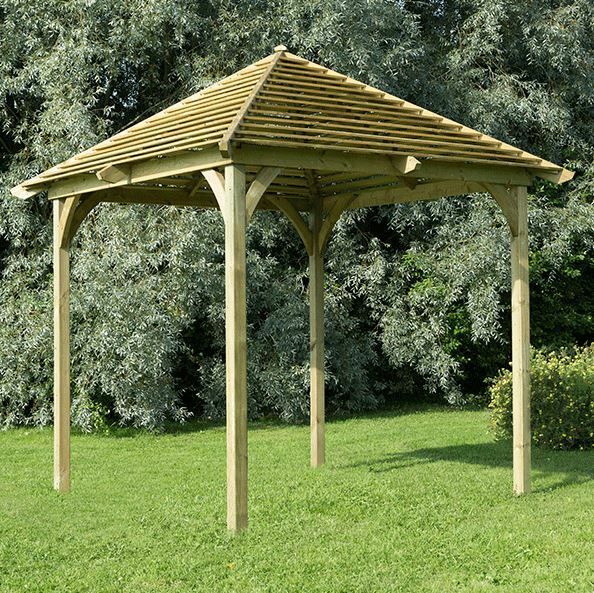 Well one thing you could get is this awesome Hartwood 9’7″ x 9’7″ FSC Pressure Treated Venetian Pavillion. This would look fantastic in any kind of garden and would serve you as a great place to sit under during the summer months and enjoy a nice picnic with your significant other or the kids. This is a very impressive looking structure as it stands at 10 feet 10 inches high at its peak, and the roof at its lowest point is 7 feet 4 inches so you will always be able to stand up under here and not have to start walking hunched over. The pavillion has a width of 9 feet 7 inches and a depth of 9 feet 7 inches so there is plenty of room to get a few people under here and not have anyone have to site outside of the pavillion. The roof of the pavillion is something that people will notice as soon as they go into your garden. To start with the sheer height of it makes it something that grabs your attention, but The apex roof has been designed to let in a little bit of natural light which is something we really like as it will make sure when you are sitting under it that you get a bit of sun, but at the same time it will not be beating down on your head. The roof is made with these thick and chunky pressure treated planks of timber and they really do look incredible. Even without touching them, from the first glance you can tell that this is one very well made structure. As we mentioned before the roof does let in natural light and it does this by having the planks spaced out. It is practical and it also give the roof a very smart appearance. At the very top there is this lovely decoration that just finishes it off very nicely. 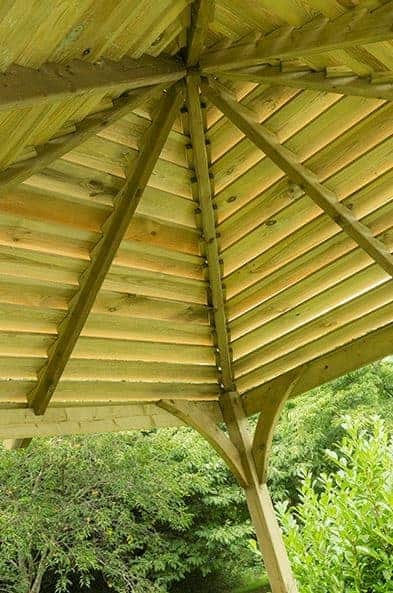 The framing of this pavillion is very well made. The four legs that support that epic looking roof are made from pressure treated timber and they are thick so they are also very strong so you have no worries about this becoming a weak structure. The pavillion is actually very cleverly made as the framing goes all the way under the roof and is supported at various points with extra pieces of framing that really do help make this one very robust structure. 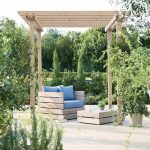 All of the timber used to make the Hartwood 9’7″ x 9’7″ FSC Pressure Treated Venetian Pavillion has been pressure treated. 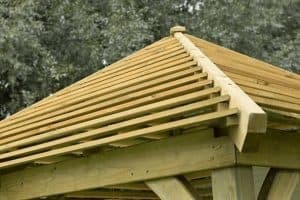 This means that there is no need for you to treat the pavillion with wood treatment as right from the start thanks to the pressure treatment process it is ready to fight off rot and decay. They are giving you a very generous 15 year guarantee with this pavilion that will cover you against rot. This is more than fair and to be honest with you, we do not see you ever having to make use of this guarantee, but it is good to have it there as it does give you peace of mind. Will you be hosting parties under the pavillion? Using it as a place for the kids to have fun? Perhaps you will be using it as a place to enjoy meals outside in the summer? No matter what you are planning on using this for, you have plenty of space here. As you can see from the pictures even if you just have this set up on grass, you can have a bench or a table and a few chairs here and it is so spacious that people will not feel cramped. This is one very strong structure and we know that some of you may be worried about a big gust of wind or a tornado coming from Oz and blowing this thing away. Well as the wood is so thick and because of the sheer size of it, you will have no worries about this blowing over or the kids knocking it down when they are trying to be Spider-Man playing around it. While we feel the stability it offers is fine, you still could dig the posts into the ground a little bit if you want. That pressure treated timber looks great, but you may want to give it a bit of your own personal style. Of course the easy way to do this is with a coating of paint which by the way we would advise doing before you install it as the last thing you want is to have to be up a ladder trying to paint the roof. The way the roof is would make it idea for hanging things from it so that is another way you can add a few things to the pavillion. They do offer a Hartwood 9′ 7″ x 9′ 7″ FSC Decking For Venetian Pergola which does cost an insanely expensive £530, but as you can see from the pictures it does really finish this off very nicely and it is made with very high quality timber. Still it is on the pricy side so you may want to consider looking into adding your own decking, which if you are a little on the handy side would not be that hard to do. Make no mistake about it, this pavillion is very well made and is done so with some very high quality materials. With the timber being pressure treated, you are going to be able to enjoy spending time under here for many years. It also does not require much in the way of maintenance either which is a great added bonus. The pavillion covers a huge amount of space so you could actually fit in a very large table or a couple of smaller ones under here. It is also very high so you have plenty of headroom as well. There is not a lot to putting this together, but you will want to have another person to help you out. Some of the pieces are very large so that can be a little on the awkward side, but there is nothing that makes this a hard and frustrating experience. 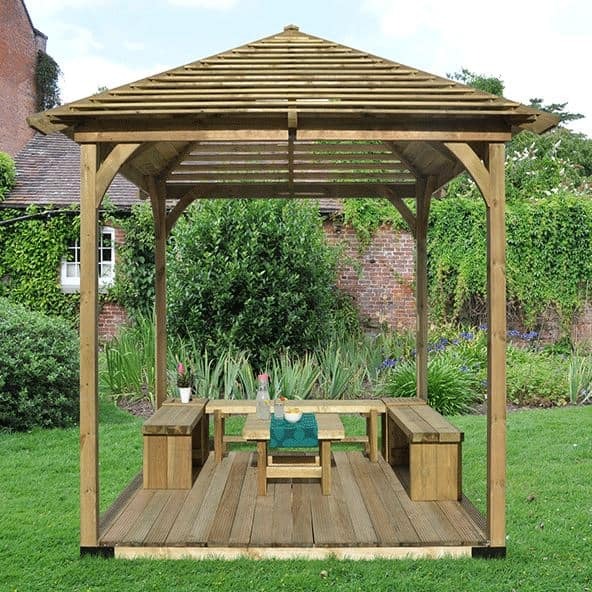 This is what we would class as a luxury item to have in your garden. 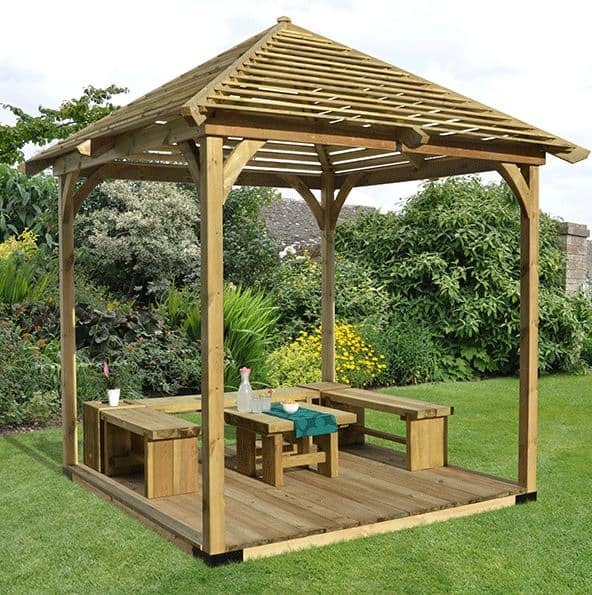 The price, especially if you add in the decking is very, very high, but at the same time this is made with the very best materials so in that regard the probably could not have charged any less for this. Final Thoughts: We really like the Hartwood 9'7" x 9'7" FSC Pressure Treated Venetian Pavillion - it just looks so cool and we are sure having a few glasses of wine under here or even a fun meal with the kids would be a fantastic experience. It certainly would make for a great addition to a large garden and it is very well made. As a matter of fact, we literally have nothing negative to say about the materials used or the design of this at all. However this is one very expensive item and while we do like it, we fully understand that this is the type of thing that is not for everyone. But for those of you who do like the look of this and are willing to swallow that high price tag, you are going to just love having this as part of your garden.